More a summer dish this, with ripe tomatoes–but I had the chevre [goat’s cheese], needed to use it and it’s already the “Ides” of March today. 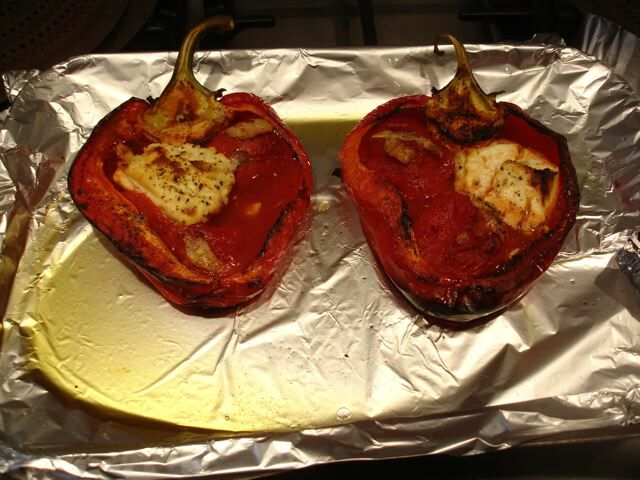 Place the pepper halves on a shallow oven tray–covered with foil. Put three tomatoes, slivers of garlic, and half the chevre in each pepper half. Drizzle over some olive oil and season well with salt and pepper. 1 medium sweet potato–pricked to avoid it bursting! 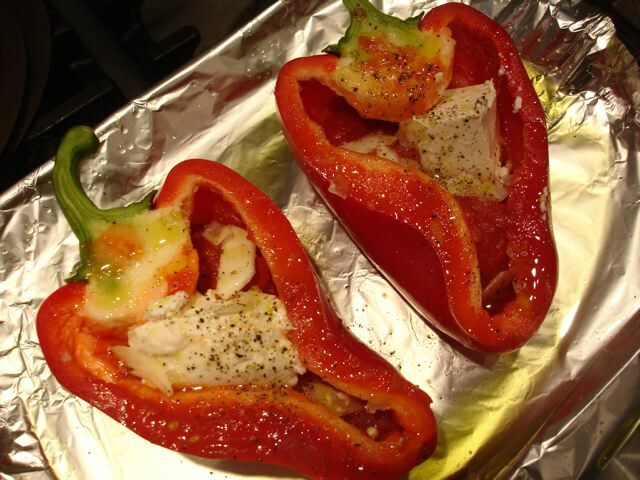 Bake both the pepper halves and the sweet potato in the oven for about an hour. 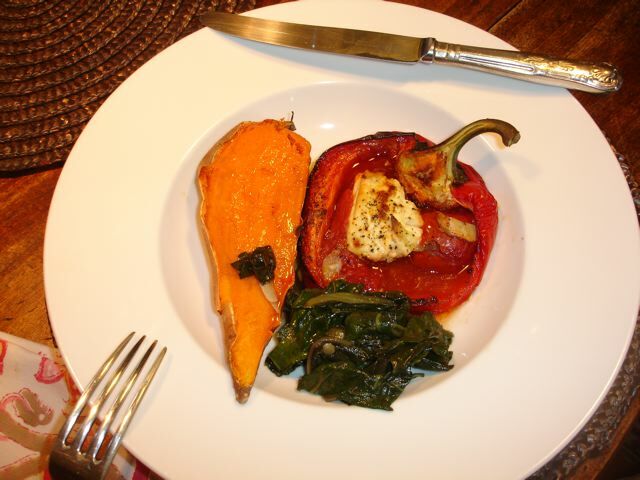 When ready halve the sweet potato–one half for each plate. A pepper half for each plate (careful not to spill too much of the juice). Add a serving of the swiss chard. Divide any juice left in the pan between the the plates. I’m sure it was tasty and the colours are magnificent on the plate. The pepper halves also freeze well. Freeze in tubs. Defrost in the fridge for several hours and then heat through in the oven. We nearly had this tonight! But settled for a whateverisleftinthecrisper soup. It was surprisingly good! Question: the ingredients’ list says ‘2/3 tinned tomatoes for each half’ which I read as ‘2/3 of one tinned tomato’–this makes sense to me as a tinned tomato (at least in Paris) is rather large. Is the ‘three tomatoes’ a typo ? Three tomatoes in half of a red pepper–well, the red pepper would be overwhelmed. Three tomatoes separated between the two halves ? Again, tinned tomatoes in Paris would overflow the edges of the red pepper. Sorry to be a noodge. The important thing, Clark, is not to crowd the pepper half. 1-2-3 toms or half tom–it depends on the size of the peppers. Good luck!